CASAC offers a human rights award aimed at enabling a South African student to study towards a degree in human rights law at Trinity College in Dublin, England. Called the Kader Asmal Human Rights Award (KAHRA), it is named after the late Professor Kader Asmal, human rights champion and political activist, who played a key role in the founding of CASAC. It is presented in partnership with the Canon Collins Educational & Legal Assistance Trust and the Embassy of Ireland in South Africa. The inaugural Kader Asmal Human Rights Award was made in July 2014 to Margaret Stride, a student from the University of Cape Town, at a ceremony at the University of the Western Cape. The keynote address was delivered by Trevor Manuel, former Minister of Finance. Asmal was born and grew up in Stanger in Natal. While still a schoolboy, he met Chief Albert Luthuli, who inspired him and gave him a life-long interest in human rights. At an early age, he was involved in the Defiance Campaign. After qualifying as a teacher, he went into exile, qualified as a barrister in London and Dublin, and received degrees from the London School of Economics and Trinity College in Dublin. He taught at Trinity College for 27 years, specialising in human rights, labour law and international law. He helped to form the British Anti-Apartheid Movement and the Irish Anti-Apartheid Movement, and was also involved in the ANC in exile. Kader Asmal devoted his life to securing, protecting and advancing human rights, focusing on questions of self-determination, the universality of human rights, and all forms of human dignity. In 1990, he returned to South Africa and was elected to the ANC’s national executive committee. He was a member of the ANC negotiating team at the constitutional negotiations, and later served in the post-1994 government as Minister of Water Affairs and Forestry and Minister of Education. His interest in and preoccupation with constitutional liberties and freedoms never diminished, and he brought these different aspects of his academic skills and humanitarian passion to bear on all his portfolios. Prof Asmal was an honorary member of the Council for the Advancement of the South African Constitution (CASAC), and one of the key protagonists in its establishment. He was also professor of human rights at the University of the Western Cape, chairman of the council of the University of the North, and vice-president of the African Association of International Law. The KAHRA forms part of the portfolio of activities managed by CASAC in support of its primary mandate, namely to promote a progressive vision of the South African constitution, which was close to Asmal’s heart. Undergraduate students at South African universities are invited to submit essays on issues pertaining to constitutionalism, human rights, and the rule of law. They are encouraged to look beyond the obvious, and seek to contribute towards an awareness of human rights and civil liberties, particularly their interface with broader issues of development and economic well-being. Students are encouraged to publish their essays in journals. 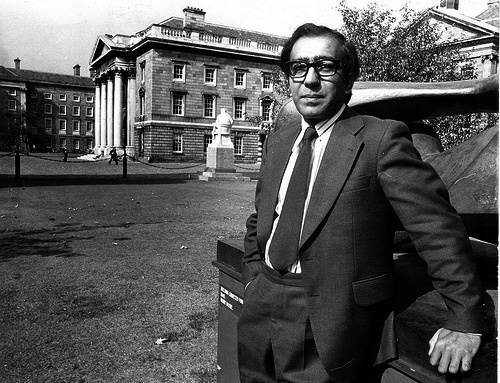 The price is a scholarship for a master’s degree in human rights at Trinity College, Dublin where, as noted earlier, Asmal spent many of his exile years, including a period as Dean of the Faculty of Law. The scholarship is presented in partnership with the Canon Collins Educational & Legal Assistance Trust and the Embassy of Ireland in South Africa. The adjudication and selection process is undertaken by a valuation committee, comprising members of CASAC’s Advisory Council as well as others.